Market Vineyards is a high-end boutique Washington winery with tasting rooms in Richland and Woodinville. We take pride in offering remarkable wines created with hand-picked fruit sourced from premier vineyards in the Columbia Valley and Red Mountain growing regions. Our attention to detail and premium quality is noticed not only in the fruit chosen, but also in the artistic abilities in the cellar. Custom French oak and American oak barrels are hand-selected to beautifully complement each vintage produced. Our commitment to maintaining the highest standard is reflected by our decision to choose one of Washington State's industry leaders, Charlie Hoppes, as our winemaker. Anyone who has cellared a bottle of 2009 Market Vineyards Acquisition Cabernet understands how beautifully it ages. This limited production 100% Cabernet Sauvignon was harvested from one of the finest vineyards in the Red Mountain appellation. Now at peak maturity, this wine was rated 91 by Wine Spectator and 90 by Wine Enthusiast in 2013. Balanced gorgeous dark fruit flavors enhance its depth and complexity in a harmonious structure and offer notes rich and polished on the palate. If this wine is already part of your cellar, we highly recommend enjoying a bottle now to experience how beautifully the wine has aged. If you no longer have it in your cellar, it would certainly be a great Acquisition for only $63. 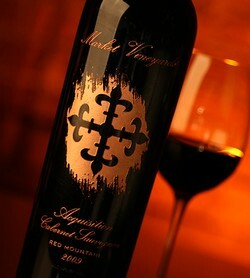 Order today online or by phone, or visit one of our Tasting Rooms in Richland and Woodinville. We are down to our final reserves of this stunning wine that was produced exclusively for our Wine Club members. Not a Wine Club member? We encourage you to join our growing family of club members to experience wines like our 2009 Acquisition Cabernet for yourself…sign up now. As we wrap up another successful year, we recently learned that Wine Enthusiast rated five Market Vineyards wines with scores in the 90s! The following scores were announced in the Best of Year 2016 issue of Wine Enthusiast Magazine, released on December 6: 2012 Benchmark Merlot (91 points), 2012 Derivative Red Blend (91 points), 2012 Acquisition Cabernet-Red Mountain (91 points), 2012 Arbitrage Cabernet (90 points), and 2012 Dividend Syrah-Red Mountain (90 points). One of the selected wines served at the Washington State Wine Lunch at the 2015 New York Wine Experience being hosted by Wine Spectator. This is Market Vineyards first varietal Red Mountain Merlot and is one of our most expuisite Merlots, as illustrated by the 93 points and Cellar Selection received by Wine Enthusiast Magazine. Although our First Edition Magnum has sold out, it was filled with the exquisite 2009 Acquisition Cabernet Sauvignon from the acclaimed Red Mountain Vineyard. Market Vineyards has resently released the 750 ml bottle of the same wine from our Library and we are offering it to our Wine Club members. See Shining Spotlight under Current News.